The breathtaking beauty of the Taglyan Arts and Cultural Complex never fails to impress every guest that steps through its doors. 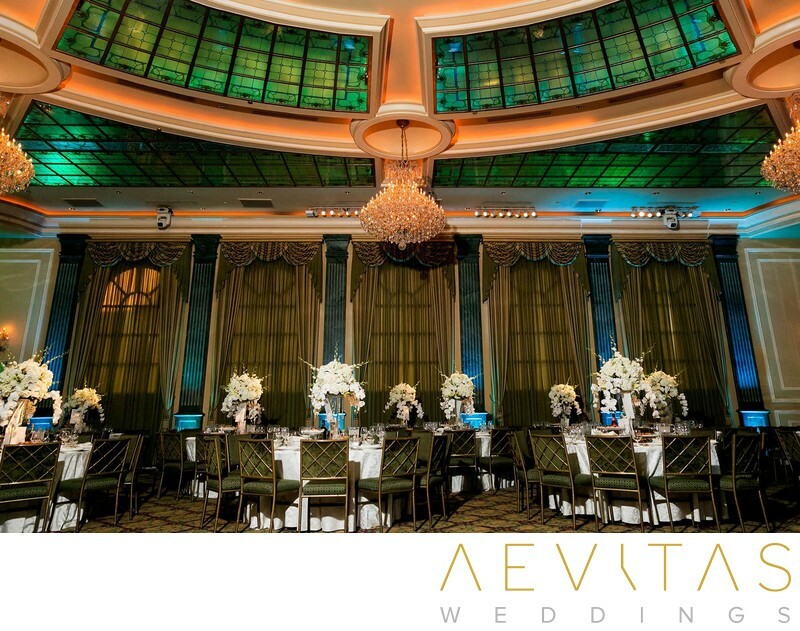 Draped in European old world opulence, yet featuring state-of-the-art facilities, it’s easy to see why this has become one of Los Angeles’ most renowned and sought-after large scale wedding venues. Although the Taglyan Cultural Complex is situated just around the corner from Hollywood Boulevard, from the moment you enter its wrought iron gates and into its leafy courtyard you feel like you have entered into another world. Its Italianesque fountain courtyard, surrounded by white roses, is an ideal location to exchange your vows, with spectacular wedding photo backdrops everywhere you look. Then head upstairs for cocktail hour on the upper patio, with its stately marble pillars and lush courtyard views. You can use this opportunity to capture bridal party portraits and family formals with stately Cypress trees, bubbling fountains and picturesque gardens as your backdrop. Then walk through the spectacular Grand Foyer, with Italian marble floors and stained-glass windows, into the Main Ballroom where your lavish reception awaits. At 7,000 square feet and with the capacity to host 500 people, it feels like no expense has been spared in the craftsmanship of this stunning space, by far one of Southern California’s most extravagant. Its cutting-edge LED lighting system can be customized to create the distinct ambiance you desire, while tear-drop crystal chandeliers exude opulence from above. Smoke machines will infuse the dance floor with a soft fog during your first dance, whilst spotlights follow your every movement, and high-definition video displays will present personalized videos of your journey as a couple along the road to marriage. With a concert hall quality sound system in place and a spacious dance floor, your wedding reception photos will be alive with energy and celebration as you and your wedding guests party late into the night. Catering is provided in-house by Divine Food & Catering who create customized menus ranging from multicultural buffets to fine dining 5-course feasts. Together with their team of highly experienced service staff, they know how to flawlessly execute large scale events, with each and every guest taken care of. Assisted by expert wedding coordinators, Taglyan Cultural Complex can transform their space to cater to your wildest wedding day dreams, whether that be a spectacular multi-cultural celebration featuring live music and performances, or a traditional wedding reception that exudes luxury and grandeur. For couples wanting to indulge their extended family and friends in an extravagant and unforgettable wedding day celebration, there are few venues in Los Angeles that are more sumptuous and impressive than the Taglyan Cultural Complex.